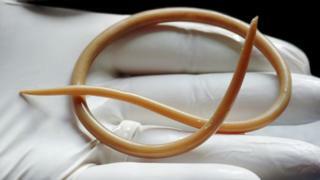 Infection with a species of parasitic worm increases the fertility of women, say scientists. A study of 986 indigenous women in Bolivia indicated a lifetime of Ascaris lumbricoides, a type of roundworm, infection led to an extra two children. Researchers, writing in the journal Science, suggest the worm is altering the immune system to make it easier to become pregnant. Experts said the findings could lead to "novel fertility enhancing drugs". Nine children is the average family size for Tsimane women in Bolivia. And about 70% of the population has a parasitic worm infection. Up to a third of the world's population also lives with such infections. But while Ascaris lumbricoides increased fertility in the nine-year study, hookworms had the opposite effect, leading to three fewer children across a lifetime. Prof Aaron Blackwell, one of the researchers , from the University of California Santa Barara, told the BBC News website: "The effects are unexpectedly large." He said women's immune systems naturally changed during pregnancy so they did not reject the foetus. Prof Blackwell said: "We think the effects we see are probably due to these infections altering women's immune systems, such that they become more or less friendly towards a pregnancy." He said using worms as a fertility treatment was an "intriguing possibility" but warned there was far more work to be done "before we would recommend anyone try this". Prof Rick Maizels, a specialist in parasitic worms and the immune system, told the BBC News website: "It's horrifying that the hookworm effects are so profound, half of women by 26 or 28 have yet to fall pregnant and that's a huge effect on life." Bacterial and viral infections try to outpace the immune system by having explosive population growth. But Prof Maizels said parasites did the opposite, "growing slowly and trying to suppress the immune system", which is why they make vaccines less effective and lower levels of allergies. He suggested hookworm may also be causing anaemia and leading to infertility that way. Prof Allan Pacey, a fertility scientist at the University of Sheffield, told the BBC: "It is very surprising and intriguing to find that infection with this particular species of roundworm actually enhances fertility." He said drugs had been tried to alter a woman's immune system to boost IVF, but without success. He added: "Whilst I wouldn't want to suggest that women try and become infected with roundworms as a way of increasing their fertility, further studies of the immunology of women who do have the parasite could ultimately lead to new and novel fertility enhancing drugs."